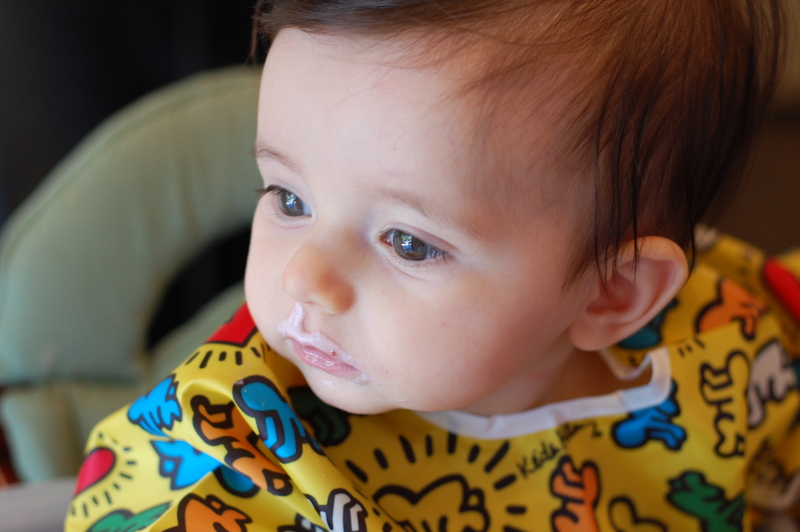 I guess your first yogurt put you into a contemplative state. You are 7 months old today! My little macaron! I call you that because, just like the French pastry, you are so delicate, you seem so tiny and sweet and fragile on the outside and all soft and gooey on the inside. But you’re not fragile, you’re tough, baby girl! I know it, and you will some day too. It’s been a big month and speaking of food, you’ve started eating! Mommy writes about it every day because it is just so much fun. Your very first food was an avocado. You’ve gotten better at swallowing and we’ve decided to skip over traditional baby food and let you find your way with the whole stuff. Discovering food with you is so much fun and you are a bottomless pit when it comes to yogurt and fresh blueberries. And you look so tiny in your high chair, you’re in your most macaron state there. You are now a professional sitter-upper and you’ve even added rocking to your sitting reperatoire. It’s like baby dancing, when you get excited, there you go! On June 28th you said ma! just one syllable, an isolated ma, not quite mama, but close enough! The next day you said ba-buh-buh-buh-ba. In any case, you are starting to babble! I’ve been lobbying hard for long strings of mamamamama, but it will come. It’s the cutest thing. You’ve since added ye-ye-ye-ye-ye, but mostly just when you’re mad. You’re still not sleeping through the night, but I can make it through a little longer. Maybe you just get lonely for Mommy at 10:00, midnight, and 2:00. And 4:30. And 5:30. That’s ok, you’re just a little snuggle bunny and I love you no matter what time it is. Your naps are predictable though, and you’ve gotten better about taking them. These macarons are small, sweet, and delicious, just like you! You’ve also started blowing raspberries! It’s really messy and drooly but oh-so-much fun! It is absolutely adorable. And I guess your sweet little bottom teeth were lonely because your top right tooth has decided to join in! I noticed a knot a couple of weeks ago, now it has mostly broken through. Is that why you needed Mommy to hold you so much? Well, I have to confess that it makes me a little sad. Those lone bottom teeth are SO cute and now it’s one more sign that you’re growing up. It’s bittersweet, baby girl. But the best thing that you do, Sugarpie, is give hugs. You give hugs! Every time that I pick you up, you squeeze me so tightly and it is the most amazing thing in the world. I will stop whatever I am doing and just enjoy the way your tiny arms feel around my neck until you stop. It is the best part of my day. So wow, look how much you’ve grown in one short month! We love you so much! And your daddy, oh how you love your daddy. It’s his birthday on Saturday and he is so happy that you’re here to celebrate it with him. You get really excited (usually start rocking and squealing) when he walks in the room. I said daddy when we were on the couch and you even looked back at the hallway–you know where he is! 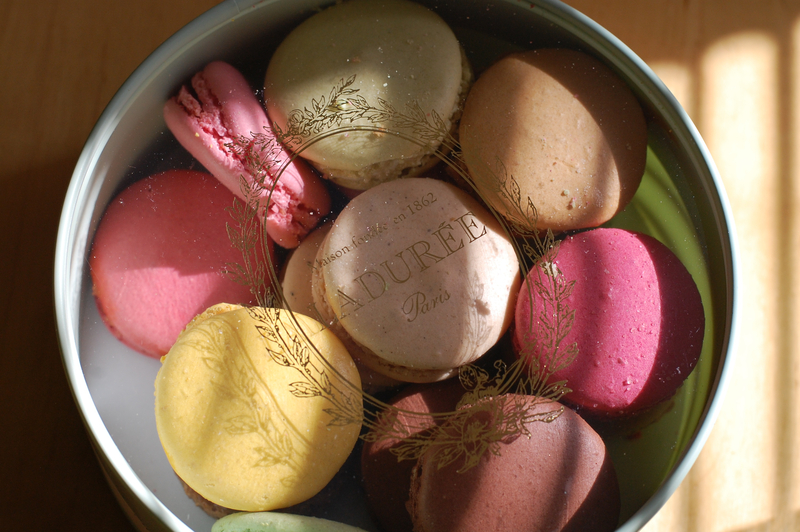 You are the sweetest and most tender macaron, better than any from the fanciest pâtisserie in Paris! Life with you keeps getting better and I can’t wait to see what this new month with you will reveal. Our little macaron! I love you both so much… happy birthday doodle bug! we love you too, daddy! Just great tears first thing in the morning!!!!! we love you to Sugarpie! !